Info "Shake your tail and catch your prey! Hey! This bird looks kind of familiar…"
A Tale of One Kitty is one of Tiny Wario's Microgames in WarioWare: Smooth Moves. Its name may be a pun on the novel A Tale of Two Cities by Charles Dickens. 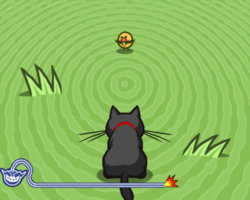 The player must shake the Wii Remote to shake the cat's tail. The cat will then pounce the bird, who will always have Wario's face. 1st level difficulty: Small bird to catch. 2nd level difficulty: Pigeon to catch. 3rd level difficulty: Chicken to catch. This page was last edited on February 20, 2018, at 17:40.